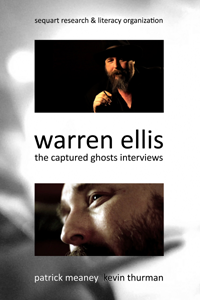 Over the next six months, I’ll be overseeing the end of shooting, post-production and the release of the documentary Warren Ellis: Captured Ghosts, following in the tradition of last year’s Grant Morrison: Talking With Gods. A lot of big movies have extensive “making of” segments, and I’m sure everyone’s seen enough of actors jumping around a giant green screen, but the process of making indie films can be a bit of a hazy mystery. So, on a weekly basis, I’m going to be taking you inside the production of a very independent film, and showing the different steps on the way to a completed movie. Let me begin by discussing a little bit about the origins of the project. Once we were into production on the Morrison film, the question inevitably turned to who would be next. What other comics creators were worthy of the documentary treatment? 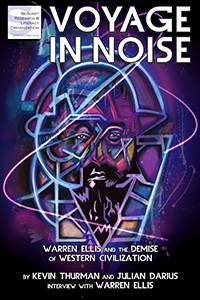 Warren Ellis was the first guy who jumped out to me, since he had the benefit of being not only a good writer, but also a really fascinating, funny guy who people want to know more about. So, we decided to approach Warren about doing a shoot. He agreed and the next thing I knew, I was in a smoke filled basement room in a London Holiday Inn Express talking to one of the most iconic comic book writers around. About a year later, I’ve edited about 20 hours of footage of Warren and about 25 of his friends and collaborators, into an 83 minute rough cut, and am working on refining that, and figuring out what to shoot to best represent Warren visually. The goal for me when doing these documentaries is not so much just presenting a series of interviews as trying to immerse the viewer in the world of the subject, and we’ve got a few new ideas for how to make this film even more immersive than the Morrison film. This past week, I’ve spent time sorting through the footage shot on a recent trip to the UK, where producer/director of photography Jordan Rennert and I filmed with Warren, Antony Johnston, Matt Jones and UK comedy legend Lenny Henry. All the interviews went really well, and I’ve integrated the footage into our current edit. The hardest part of these movies is making the first edit of the movie, figuring out how to take a gigantic pile of footage and sequence it into a linear story. While we’re generally sticking to a chronological approach, there’s a lot of tricky elements in sequencing the film. 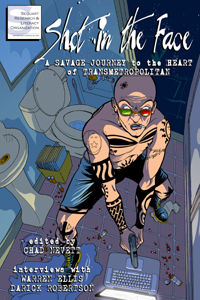 To take an example in the Warren movie, Transmetropolitan ran from 1997 to 2002. In 1997, Warren was early in his career, and Transmetropolitan represented his biggest stage yet for creator owned work. 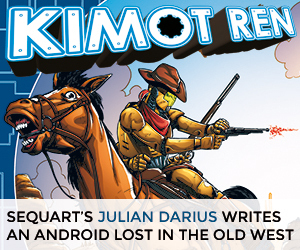 By 2002, he’d written The Authority and Planetary, run the Warren Ellis Forum, and was one of the most controversial and celebrated creators in comics. So, as an editor, I’ve got a number of options in portraying Transmetropolitan. Is it presented as the start of his success, a nervous young creator stepping on to the big stage, or do I focus on its conclusion, as the ultimate expression of Warren at the height of his powers? One can try to bridge the gap between the two, but ultimately I decided to use Transmetropolitan as an example of Warren coming into his own, and I positioned it before The Authority, Planetary or his creation of the Warren Ellis Forum. All these options are viable, but sometimes, it’s about finding the truth that creates the most seamless viewing experiences, and not stretching things so far that they become inauthentic. Invariably, part of making a documentary about someone is fitting a complex life into a story structure. At its best, the story just seems to emerge, and in the case of this movie, that’s largely happening. The pieces fall into place, and in the end, hopefully you feel like things in the film could never have been sequenced any other way. NEXT WEEK: Return for a more detailed explanation of what it’s like to film with Warren! 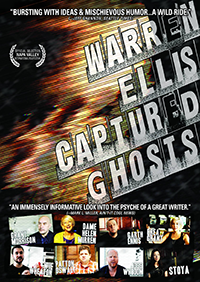 For more information on Warren Ellis: Captured Ghosts, click here or here. 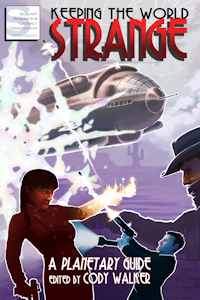 You can also make pledges towards the film’s production and earn cool rewards here. Tagged Warren Ellis, Warren Ellis: Captured Ghosts. Bookmark the permalink.